This extra large, extra special wooden drum is a gift to delight and impress and be remembered. 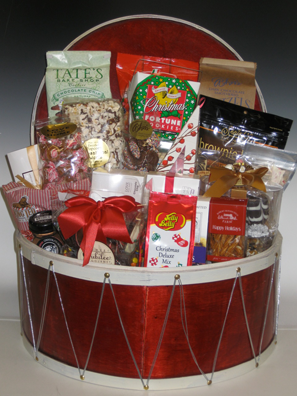 This drum rolls in, filled with sweet, savory and gourmet selections. Homemade cookies and loaves, chocolates, candies, nuts, gourmet popcorn and chocolate covered pretzels, teas, hot coco, holiday jam, crackers and more. Every size drum is filled to delight and impress. 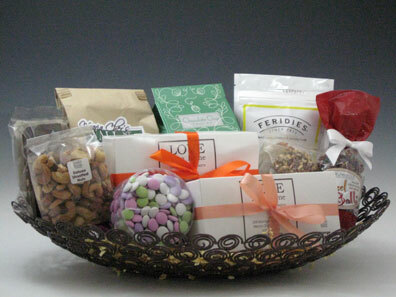 Indulge someone this holiday with a great basket filled with fine quality chocolates, cookies, snacks and nuts. Beautiful boxed sea salt Caramels, peppermint truffles, 22oz Funky Chunky gourmet chocolate pretzels, chocolate mint cookie joys, Love From Home homemade cookie selections, gourmet popcorn, mixed nuts, fruit and nut mix, dipping pretzel with sweet mustard dip…the list goes on! Available in Red, White and Green. Truffles, Funk Chunky chocolate covered pretzels, chocolate mints, malted balls, cookies, nut mix, raspberry filled candies, white chocolate coated snack mix are a great combination for sweet indulgence! Celebrate the holidays with all that is yummy! 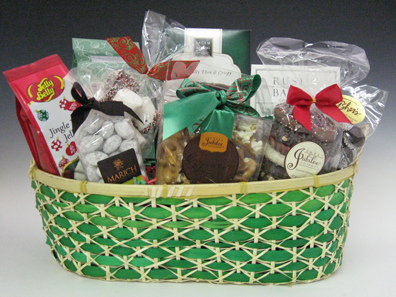 Sugar cookies, chocolate chip, lemon and chocolate covered Oreos, chocolate covered pretzels, jumbo cashews, cheese sticks, pretzel sticks with mustard dip, an assortment of holiday chocolates and candies bring a basket full of sweet and savory fun for everyone. 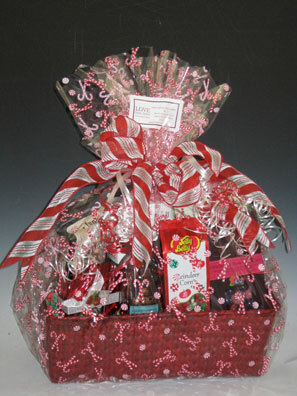 Send the holiday cheer in this basket filled with assorted treats for everyone. 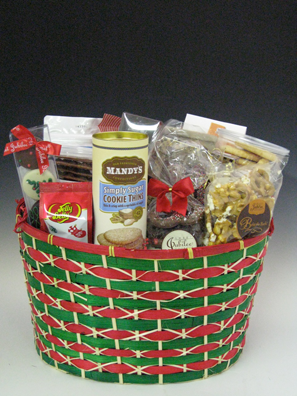 Chocolate covered mint cookies and chocolate chip, gourmet topped chocolate covered pretzels, decadent popcorn brittle, cocoa dusted almonds, non pariels, holiday candies and nut mixes, peppermint bark and cheese straws are ready to enjoy. 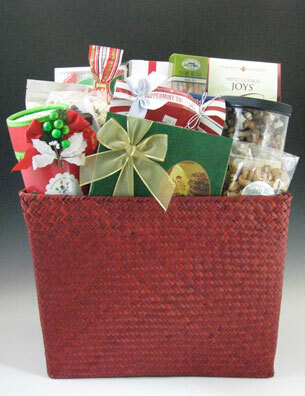 A variety of some of our favorite selections are packaged in this festive colored basket. Chocolate drizzled popcorn, chocolate covered grahams, chocolate chip cookies, chocolate malt balls, fruit & nut mix, chocolate covered cherries and more. Gift wrapped with that special touch! 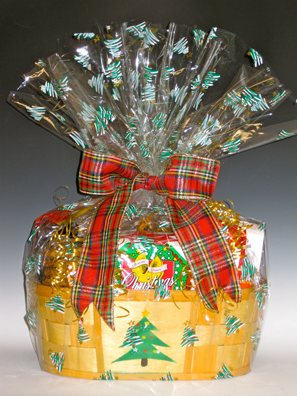 Natural tone basket with a colorful Christmas tree sends happy holiday wishes with a collection of sweet holiday treats all wrapped up in Christmas tree colors. Soft touch of silver brings a little shine to the holiday table and all year round. 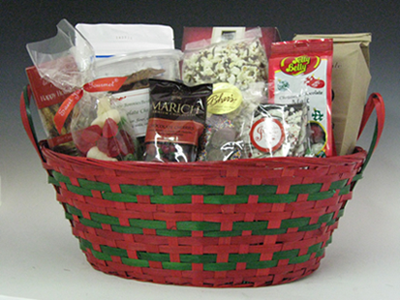 These baskets are sent with a variety of sweet and savory selections including our homemade cookies, chocolate covered pretzels, mint lentils, jumbo cashews, fruit & nut mix, chocolate covered dried strawberries, tea, and organic hard fruit bites are some of the varieties to enjoy. 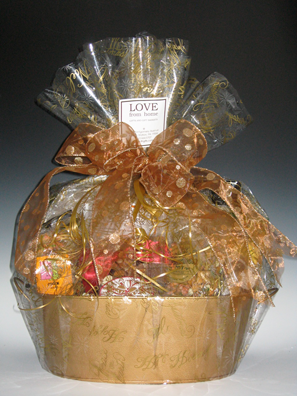 Warm touch of gold adds to the festive season and this comes filled with a full variety of our delicious and favorite assortment of cookies, chocolates, truffles, nuts and snack treats, candies and more…beautifully gift-wrapped with a touch of gold! This is a keeper! 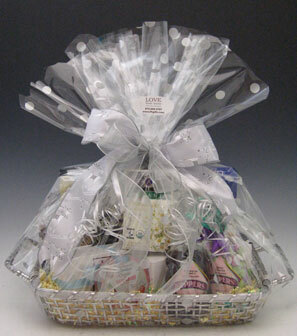 Entertain during the holidays with this basket filled with an assortment of great party selections and keep the beautiful basket for entertaining all year round.